El Tovar Hotel is the iconic Grand Canyon National Park lodge that is located directly on the South Rim. This review features room photos, thoughts on whether staying here is worth the money, and more. I won’t bury the lede: if you have the means, El Tovar is unquestionably where you should stay when visiting Grand Canyon National Park. Everything from the amenities to the rooms to the restaurants are a prime example of rustic National Park lodge luxury. 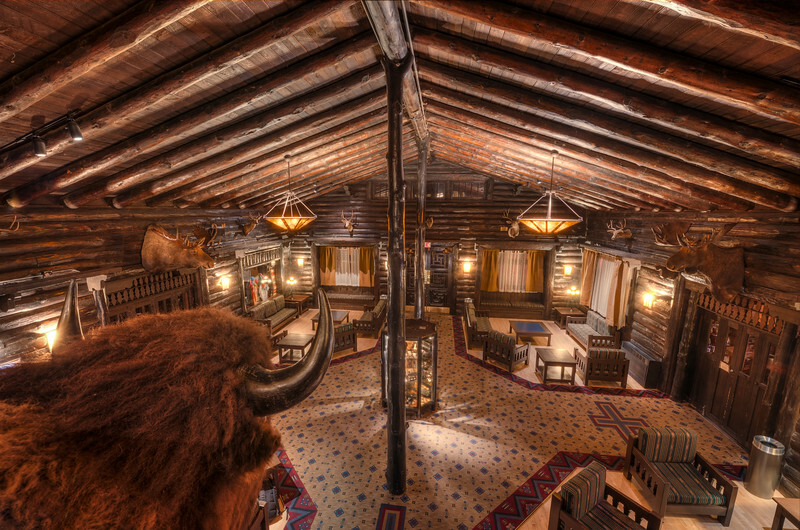 Not only is El Tovar Hotel a National Historic Landmark–it’s also Grand Canyon’s flagship lodge. Moreover, it’s an incredibly popular hotel, with prime summer dates often selling out a year in advance. All of this combined means rates that range from around $150 to $300 per night for most standard rooms. Honestly, the hotel could probably charge a lot more if the National Park Service didn’t cap higher numbers as being exorbitant. For starts, El Tovar Hotel is certainly not for everyone (if you’re used to high end luxury or boutique hotels, you will likely find it lacking in the luxury department). It really appealed to me, though. It’s both nice and charming, and all too often you only get one or the other with a hotel. New luxury hotels undoubtedly have higher end amenities and furnishings, but their designs tend to blend together and often just look like upscale IKEA showrooms. El Tovar Hotel’s beauty starts with its main lobbies, which are supported by Oregon pine logs and stone, and adorned with taxidermy of animals from the region. There are also chairs for relaxing, stained glass lamps, and a fireplace that’s always on. There’s also a lot of art. This was perhaps my favorite aspect of the hotel. From portraits of dignitaries to landscape oil paintings of the Grand Canyon and American West, it seems that the El Tovar has an impressive art collection. The second floor atrium is a nice, quiet (and brighter) place to go in the morning to read the newspaper (provided to each room) and have some complimentary coffee (available to hotel guests on this level each morning) before starting the day. Or, in my case, transferring photos from my camera to my laptop in the middle of the night! This area of the hotel also has beautiful artwork and design. Suffice to say, El Tovar Hotel has a lot of history to it. Moving past the lobby and atrium, our room was great. The bedding materials were on par with luxury accommodations, and the pillows were high quality. While not luxury accommodations in the standard use of the term, this was luxury in the sense of a National Parks lodge. My only complaint about the room would be the bathroom, which was small and lacking in counter space. The bathroom wasn’t bad, it just wasn’t on par with the rest of the room. In my research prior to our trip in determining where we should stay, I came across several reviews indicating that the rooms at El Tovar Hotel were outdated and small. In terms of dated-ness, this was not the case with our room, at all. To be sure, it wasn’t the pinnacle of luxury hotel accommodations, but in terms of National Park lodges (and I’ve stayed at several), I can think of none that surpass El Tovar Hotel. I’d describe the design as ‘well-appointed rustic,’ with several nice, modern amenities, but the charm and design you’d expect from a National Park lodge. I suspect these reviews are outdated, as the El Tovar’s rooms have all been updated and modernized recently. In terms of size, my understanding is that this is an accurate assessment of the lower-tier rooms, at least based upon the El Tovar’s own website. However, we stayed in a “Standard 2 Queen” room, and it was incredibly spacious. As you can see from the photos, there was plenty of space in addition to the beds, and our room had a Kuerig, fridge, LCD television, and plenty of space for walking within the room. So, if space is an issue, get one of the queen rooms rather than the cheaper double rooms. In term of amenities, location is number one. Based on the orientation of the hotel, I suspect that no guest rooms (maybe the suites?) have full views of the Grand Canyon, but just about every room should have a partial view. The better views come from the back porch, El Tovar Dining Room, and the lounge. El Tovar is quite literally on the South Rim of the Grand Canyon, with maybe 100 feet or so separating the edge of the hotel from the edge of the Grand Canyon. Dining is another highlight of the El Tovar Hotel experience. We dined at both the El Tovar Dining Room and the lounge, and were very impressed by both. I’ll be doing a separate post covering Grand Canyon dining, but suffice to say, if you’re visiting Grand Canyon National Park, make sure you have breakfast or dinner in the Dining Room. The food is considerably better than the ‘mess halls’ around the park, and although it’s more expensive, it offers far better value. We made the mistake of eating in the Maswik Lodge Cafeteria once and regretted it. The food there was overpriced and low quality, as compared to slightly more expensive (or much more, depending on what you ordered) and significantly better food at El Tovar. Of course, all of this comes at a price. As I stated at the outset, El Tovar is not cheap. We paid approximately $200/night for our room with two queen beds, and that was with a special winter promotion due to a refurbishment occurring at the hotel. (We were told by the front desk staff that this was the first time El Tovar had been discounted–we never once heard any noise or saw any signs of refurbishment, so it didn’t affect our stay at all.) If money is a serious consideration and rates are too high for you to justify at the El Tovar Hotel during your visit, give serious thought to Bright Angel Lodge. While I can’t speak to the rooms, its rates are very reasonable and its common areas that I saw are quite nice. It’s also located adjacent to the El Tovar on the South Rim. While there is other lodging in the park, El Tovar and Bright Angel Lodge are the only places I’d stay (besides Phantom Ranch, but that’s a different story). I would strongly advise against staying off-site due to the drive time necessary to get into Grand Canyon National Park from the outlying towns, and also because the lodges provide the full National Park experience. Overall, El Tovar Hotel is definitely worth it if you have the money to spend on a premium hotel experience and you appreciate the nice, rustic charm of the National Park lodges. If it’s not in the budget, saving money by staying at Bright Angel Lodge is definitely advisable, especially if that allows you to dine at the El Tovar Dining Room. Even if it is in your budget, El Tovar Hotel is not for everyone, and El Tovar Hotel will be lost on anyone strictly concerned with modern luxury and design. However, for its core audience (and this probably describes anyone wanting to stay at a National Park lodge in the first place), El Tovar is a excellent option with few equals. You can book El Tovar Hotel directly through its website. To learn more about El Tovar and other flagship National Park Lodges, check out the PBS book Great Lodges of the National Parks. Have you stayed at the El Tovar Hotel? If so, what did you think of it? If you haven’t stayed there, would you consider it as part of your trip to Grand Canyon National Park? Please share your thoughts in the comments! My husband and I stayed at El Tovar two nights, 9/10 and 9/11, 2018. I was very excited to have obtained reservations and very much looking forward to our stay. We arrived in our room to a running toilet and no air conditioning. On arrival to our room the temperature was 78 degrees and rose to 83 degrees during the one hour we were in our room. The staff moved us to the Mary Colter Suite. I learned at that point that there are only 4 rooms at El Tovar with a view and only three are available for rent. Our original room had a view of the roof and only the roof. We had been assured that all rooms have at least a minimal view. Not true. I suggest that anyone thinking about the El Tovar only stay there if you can afford one of the rooms with a view. If you can’t, there are other Grand Canyon accommodations that have views. The staff deserve great praise for their willingness to provide alternative accommodations to us at the rates we originally agreed to. We didn’t use the dining facilities to the very high prices. I love El Tovar! We spent our Thanksgiving at the Grand Canyon this past year and we chose El Tovar for our Thanksgiving dinner! It was deliscous! I would recommend to anyone! found this post while looking around (from your recent DTB giveaway)… when you ate in the dining room did you see the El Tovar “Critter” running around the rafters? Looked like a mix between a raccoon and a lemur… the staff was incredibly unconcerned, and it was so funny to see a furry friend running around where food is being served! Thanks! We’ll try it out! We’re planning a trip to AZ/NM at the end of April. We’re only going to be able to spend at day at the Grand Canyon and we’re staying in Sedona, but I’m glad to see this post. I love unique hotels so I’ll definitely stop by and tour the lobby. Have fun in Sedona (we visited there, too) and at the Grand Canyon. If you have the time, I highly recommend a meal at the El Tovar Dining Room! How formal is the restaurant? We’re planning on doing a bit of light hiking that day so I wouldn’t want to be under-dressed for dinner! The official dress code is ‘resort casual.’ During our meals we saw a wide variety of attire. From people in hiking clothes to people in sport coats and dresses. I’d probably try to land somewhere between the two–it’s a nice restaurant, but not at all stuffy. My husband and I stayed here in June of 2013 and it was a great experience. The lobby had a cozy feeling to it despite the dead animals on the walls and the restaurant was one of the best meals we had on our trip. One of the best things was sitting outside on the rocking chairs and looking at the canyon. I was shocked at how good the El Tovar Dining Room was, especially considering how difficult it would be to acquire some of that food (freshly) out in the middle of nowhere.